Just a silly card I made to cheer up a friend who is having some problems. She likes to sew and I thought this cute little mouse from Paper Pretties would make her smile. Colored the image with Prismacolor pencils. Cut out the image and background layer with Cottage Cutz Stitched Square Set. Chevron background layer and scalloped border were cut out with MFT dies, tag with Spellbinders Charmed I'm Sure die and photo corners with Quikutz photo corner die. Added some lace and prima flowers with punched leaves. Your card will surely make your friend smile, Deloris! Thanks for joining us at the Simon Says Stamp Wednesday challenge! tee hee! She is gonna luv her card Deloris.... A card to brighten and put a big smile on her face that's for sure.....I've been sort of lost in bloggy land this month - being to busy trying to do so much with up coming orders. This put a big smile on my face this early morning. Ahhhh, you brought back great memories of Paper Pretties. The problem I'm now having is forgetting all the wonderful images I have absorbed and all the new stuff out there. I must go back and look at some of my PaperPretties. I want so many dies like you used. I would like to get dies from MFT, BUT shipping is always an issue so I don't buy. 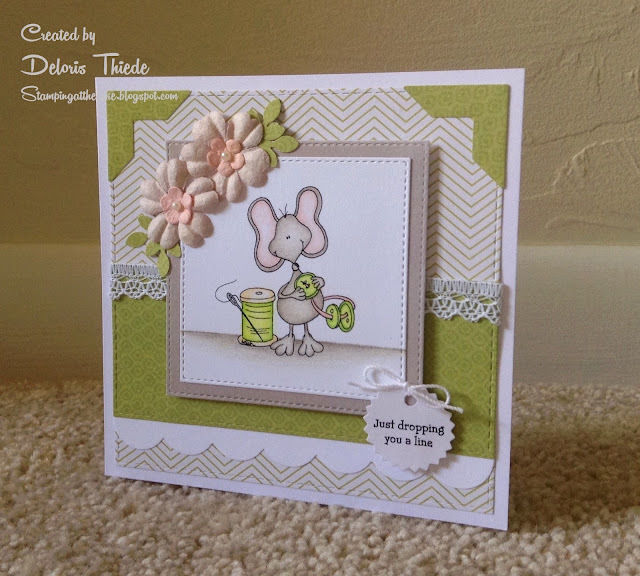 An adorable card Deloris, such a sweet image and lovely colours. This is just a super cute image!Great job grounding your image too. Sure to cheer up your friend for sure!